Tasmania's Wineglass Bay is like a little slice of paradise, no wonder why it's considered one of Australia's best beaches. We’re pretty lucky in this country to have some of the best beaches in the world, so when TripAdvisor released its yearly ‘Top 10 Beaches’, many were surprised that only one Aussie beach made the list! Amongst those confused by the ranking, were the very vocal members of luxuryescapes.com, a members-only travel site that offers high-end holidays. The well-travelled folk who holiday with Luxury Escapes are used to holidaying to some of the world’s most picture-perfect destinations – so it’s safe to say they know their beaches. Here are their picks for the best beaches in Australia. Swirling white sands of Hill Inlet at Whitehaven Beach, QLD. What is there to say about Whitehaven Beach that hasn’t been said before? The silica sand is impossibly, velvety soft and unicorn-white, and it’s so clean, so untouched, that it’s hard to believe you’re only a boat ride away from the fully functioning resort-ville of the rest of the Whitsundays. Coca Chu is an Asian fusion restaurant 11.5km from Whitehaven but serves up incredible vegan-friendly grub in a supremely picturesque setting. It also caters to the meat lovers among us, so don’t fret. It features the hawker-street style food of South East Asia that you’ll be craving during your swim. Tasmania’s Wineglass Bay is like a little slice of paradise, no wonder why it’s considered one of Australia’s best beaches. 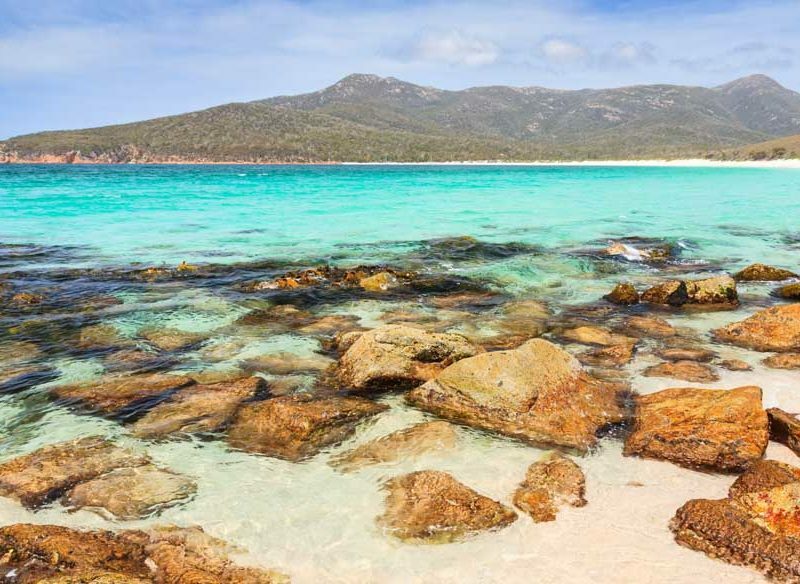 Seemingly situated on the edge of the Earth – next stop, Antarctica – Wineglass Bay on Tasmania’s Freycinet Peninsula is a little slice of paradise down south. Surrounded by lush bushland, it’s also home to some of the most luxurious accommodation in the state (case in point: Saffire Freycinet). Freycinet Marie Farm is the perfect pit stop for any seafood lover. You can pick up sumptuous oysters to take back to your accommodation – or to the beach – or settle in for some grilled Tasmanian garlic scallops and a bread roll. Delicious. Just a short drive from Sydney, Hyams Beach is renowned for its feathery-white sand and crystal-clear waters. Its sands have been recorded as the whitest in the world, so it’s hard to believe that Hyams Beach is only three hours out of Sydney. If you get tired of those crystal-clear waters and feathery sand, then check out nearby local bushwalks to experience breathtaking views over Jervis Bay. Just 3.8km away from Hyams Beach is Albert N Miso, a divine little cafe located in Vincentia. With a hearty breakfast and lunch menu, plus delicious burgers all day (try the fish burger with tomato salsa, tartare and sprouts), and they also start a tapas menu at 6pm, meaning your stroll from the beach into town will be well worth it. Tucked away in Western Australia, Turquoise Bay is a secluded spot of heaven, it’s also perfect for snorkelling. When you think of paradise-like beaches, something a lot like Turquoise Bay in far northern Western Australia will spring to mind. Think azure-hued waters, soft white sand, and not another person around for miles. And did we mention there’s some of the best snorkelling around? Adrift Cafe are your perfect pick if you’re after an incredible big breakfast that’ll do more than just touch the sides – an attractive option if you’ve gone a little heavy on the Coronas the night before. They also tend to feature specials with a Middle Eastern flavour and change the specials up weekly. Crystal-clear water and unbelievably white sand at Eagle Bay in Western Australia. Only a stone’s throw from Margaret River, you’ll find Eagle Bay. White sands and glistening waters contrast against red Australian rock. Head up to Cape Naturaliste Lighthouse to see where the Southern and Indian Oceans meet. Eagle Bay Brewing Co has a brilliant, casual vibe and outdoor seating and dishes up amazing dishes with a mix of Asian and Italian influence. Order the soy chilli cashews and peanuts for a nibble with your brew, or the espresso braised BBQ brisket for something meatier – literally. The honey & sesame chicken with chinese sausage is also a great choice. Beautiful Four Mile Beach in Queensland. Such is the length of this celebrated Port Douglas beach, that it was used as an airplane runway back in the early days of aviation. It’s beautiful, clean and not too overcrowded at this time of year (just watch out for crocs). When you’re done at the beach for the day, head over to The Beach Shack on Barrier Street for incredible pizza and cocktails. And when we say come from the beach, we mean it – the restaurant’s floors are already sandy – and surfboards hang from the walls – so you’re bound to fit right in. Pennington Bay’s remote location means that you can have this photogenic beach all to yourself. Kangaroo Island, South Australia. This beach on Kangaroo Island deserves a place on your bucket list. Not only is the surfing world class, but the remote location means it’s secluded from the hordes of tourists who would usually frequent a beach this photogenic. Cactus serves up incredible coffee and food on Kangaroo Island. They do a Friday night Mediterranean feast that draws massive crowds and again, the coffee – very, very good. Tallow Beach in New South Wales can be enjoyed with your furry pooch pals. A little bit tired of busy Byron? Head over to Tallow Beach, just a few kilometres out of town, and feel immediately rested. Dogs have a good long stretch of beach to themselves, so your pooch doesn’t have to stay at home while you catch some rays. Suffolk Bakery offers up some of the best freshly baked goodies you can get your hands on. They often showcase live musicians alongside their fresh coffee and amazing croissants. Perfect for a takeaway lunch or to nestle in and enjoy the atmosphere. Trinity Beach is just a short trip from the Cairns city centre and is perfect for families. Even though Trinity Beach is a suburb of Cairns – and only 20 minutes from the airport – you’d hardly know it, with properties and restaurants set back from the sand, so the ocean feels like it’s all yours. Trinity Beach Bar & Grill offers up delicious eats, including the freshest fruit and yoghurt, they also do delicious hot sandwiches and even themed nights such as ‘pasta night’ – that one is not to be missed – and neither are the cocktails. A romantic sunset over Seaford Beach in Victoria. Boasting a long pier dotted with fishermen, Seaford Beach is the gateway to Victoria’s Mornington Peninsula, and only a 45-minute drive from Melbourne. The shallow waters and gentle waves around the pier make it perfect for swimming with little ones. Beach Cafe Seaford offers coffee, cake and a light daytime menu and an incredible terrace overlooking the bay. The atmosphere is relaxed – and kind of feels as though you could stay there all day – but how can you when the beach is calling so loud?